As if KILO hadn't done it all already, they came back with a bang creating a hot new line of vape liquid known as The White Series. It is the counterpart to the extremely popular Black Series. KILO is by far one of the most popular and top selling brands on the market. Their newest premier vape liquid is called Cinnamon Roll E Juice by Kilo White Series 60ML. It tastes just as it sounds, like a delicious cinnamon roll topped with cream cheese icing. 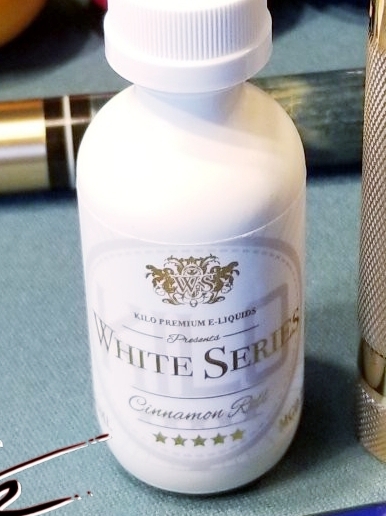 The guys over at KILO are masters at creating genuine vape juice, and Cinnamon Roll E Juice by Kilo White Series 60ML is a prime example tasting just as it is profiled to. On the inhale you will taste the sweet cinnamon sugar roll, followed by the creamy undertones of the icing on the exhale. It is an all around delightful experience. Sometimes cinnamon themed vape liquids can come off a little harsh. The throat hit can be too sharp and often uncomfortable on the throat. This is not the case with Cinnamon Roll E Juice by KILO White Series 60ML. The cream cheese icing neutralizes the hit creating a soft and smooth throat hit that is truly incredible. It is crafted with a traditional 70&/30% VG/PG blend. This means that it creates a strong amount of flavor paralleled with awesome cloud production. This also means that it is great for both dripping on an RDA and filling in tank. As usual, all of the KILO White Series e liquids come in outstanding packaging. Cinnamon Roll comes in an elegant white box with gold accents. On the box sits the e juice brand name and flavor name written in gold font. The juice itself comes in a white bottle with color themed that matches the box. We carry Cinnamon Roll E Juice by KILO White Series in a 60ML bottle in 0MG, 3MG, and 6MG nicotine levels. This e liquid brand is the newest thing to hit the industry, your are going to be bummed if you miss out on it. Grab some today before its all gone. This juice is great. I order all the time. Awesome juice really enjoy the flavor, nice tones. This E-Juice was the first one I ordered from this company. Love the flavor, it reminds me of my grandma's cinnamon rolls. Great product! Best on line vape store, fast delivery..